Contemporary art has seen a marked increase in practices that defy traditional descriptions of media. Categories like painting, drawing, sculpture and photography no longer suffice to describe the full range of processes and forms that artists engage. Even relatively newer media categories like conceptual art, video art and performance art cannot encompass what many artists today do in their studios and in the streets. Many artists approach subject matter conceptually or thematically, choosing materials, processes and forms that resonate with a particular theme, while others complicate formal concerns directly by working through and across many media at once, or sequentially, arriving at products that resist easy categorization. Contemporary music has also seen a rise in the combining of musical practices and genre; even of individual pre-existing songs. Akin to the post-modern visual art strategy of combines today’s pop mash-ups take elements from two or more forms and slam them together, creating a new synthesis of musical sounds. Theorists often simply create new categories to deal with this phenomenon, although another solution is the acknowledgement that the slippery liminal ground between definitions is a place unto itself: Intermedia. The upcoming exhibition Mash-ups seeks to display a group of creative work that defies categorization by medium. We invite proposal submissions from artists in any field, including but not limited to variations of traditional visual arts practices, music and sound, film and video, performance and relational forms, and new media. The exhibition will take place from February 24-April 1 in the Sonnenschein and Albright Galleries in the Durand Art Institute Building on the campus of Lake Forest College. There will be an opening reception on Thursday, February 24 from 7:30-9:00 in the evening. Creative individuals and groups are encouraged to submit images in jpeg format, videos in quicktime or DVD format, sound files, links to materials archived online, written materials, or whatever documentation is necessary to best convey your existing work. Work must be submitted by email or received by mail by January 6, 2011. Information about the Sonnenschein Gallery at Lake Forest College can be found at http://www.lakeforest.edu/academics/programs/art/galleries.php Please do not hesitate to contact exhibition curator Eli Robb (robb@lakeforest.edu ) or Sonnenschein Gallery Director Rebecca Goldberg ( Goldberg@lakeforest.edu ) if you have any questions about the exhibition or the application process. Exhibiting artists will be notified by email by January 13, 2011, and will be asked to submit additional information about themselves and their work at that time. 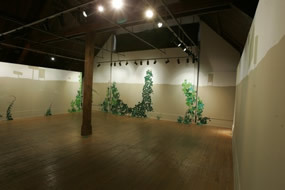 All artwork to be exhibited must be received by February 17, 2011. Exhibiting artists are responsible for any shipping and insurance costs for the transport of their work to and from the gallery. All artwork will be insured by the gallery during the exhibition.